The operation and freedom of movement of all pedals must never be impaired by objects or floor mats. 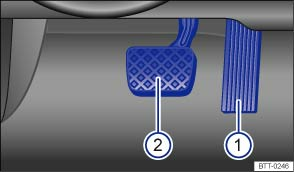 Only use floor mats that leave the pedal area free and can be securely fastened in the footwell. If a brake circuit fails, you will have to depress the brake pedal further than normal in order to bring the vehicle to a stop. 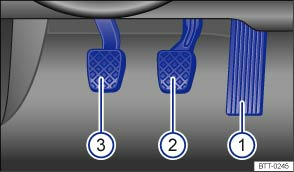 Objects in the driver footwell can hinder pedal operation. This can lead to loss of control of the vehicle and increase the risk of serious injury. Please ensure that all pedals can always be operated without any hindrance. The foot mats must always be properly secured in the footwell. No additional foot mats or other floor coverings should be placed over the fitted foot mat. Ensure that no objects can enter the driver footwell while the vehicle is in motion. The pedals must be freely operable at all times. For example, the braking distance to fully stop the vehicle will be longer if a braking circuit is faulty. The brake pedal will have to be depressed further and harder than normal.